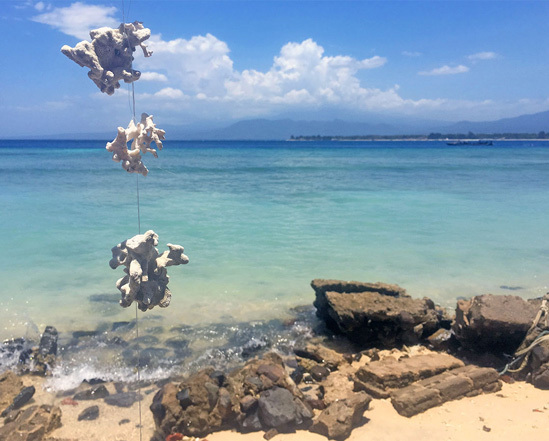 The Gili Islands are three small islands that were uninhabited not so long ago, but nowadays we can relish their pristine nature. Stunning beaches with beautiful coral reefs are just perfect for snorkelling and diving. Tender white sand warms your body and cool turquoise ocean refreshes your mind, gifting you a fabulously diverse underwater world to enjoy. There is no bustle, no cars, bikes and traffic jams. You can move around the islands on bicycles or horse-drawn carts, however the islands are so small and cosy that you can easily get around on foot, enjoying the beauty of the scenery. Although the islands are similar, they have different spirits and each island has its own peculiarity. Gili Trawangan is the largest and most populated island. It has a cave tunnel, which gives the island its name: in Indonesian, terowongan means “tunnel”. The island is bustling and buzzing almost like Bali. Tourist boats arrive in the port on the western side of the island. Here you’ll find good restaurants, hotels, cosy cafes and noisy bars. As the island is full of shops, ATMs and places to rent snorkelling and diving equipment, you can travel light. If you love active holidays, a variety of activities like parasailing, wakeboard, subwing and paddle board yoga will keep you entertained. 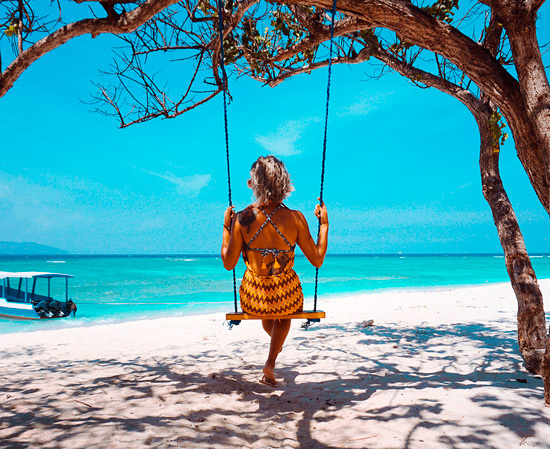 Gili Trawangan is also full of the Instagram-favourite water swings. If you snorkel or dive in the northern part of the island, you can easily see sea turtles. The southern side of the island is full of picturesque places for relaxation and photoshoots. Trawangan is the most popular and frequently visited island among the three Gili islands. You’ll usually find trees casting shadows all along the beach - these are great for hiding from the sun. However, the downside is that dry leaves may scatter all around. Along the beach you’ll also see bars and restaurants, and you are welcome to use their sunbeds as long as you get something from the menu. On the western side of Trawangan there are many stylish and pleasant sunset beach bars. Among the most peculiar spots is a very stylish Casa Vintage Beach and its bars - Exile with occasional drumming performances, Aston with evening movie screenings and Window Bar, which is popular purely due to its location right by the beach entrance as you follow the road from the centre of the island. The evenings here are full of soothing music. Jockeys ride around the beach offering horseback rides, and visitors take photos of each other on at least 7 different water swings. Northern Trawangan beaches are overall quite similar to ones on the west. There are no sunset bars, but the atmosphere is just as tranquil and calm. Make sure you swim at high tide. Here you’ll notice less deciduous trees and more conifers. Savour the beauty of Gili Trawangan by taking a speed boat - register online and get your tickets in advance. Your ticket also includes a return transfer to the port. If you wish to unwind and get a full experience of this magnificent island, we recommend booking a 2 day/1 night Gili tour. The price includes transfers, superb hotel accommodation, snorkelling and much more. Find out more at MyBaliTrips.com. In Indonesian language air means “water”. As you may guess, this island has fresh water. This is the second largest island, and you’ll need no more than three hours to walk around it. This island is not as noisy as Trawangan, and is famous for its numerous restaurants and parties. Gili Air is a popular choice for honeymoons and those who seek to indulge in romance. The island has perhaps the most beautiful beaches with amazing views of cloud-covered Lombok Mountains. The south of the island is the liveliest spot with a boat port and facilities for taking tours and snorkelling. On the eastern side of the island you’ll see magnificent Bounty-style beaches with white sand and Lombok views. 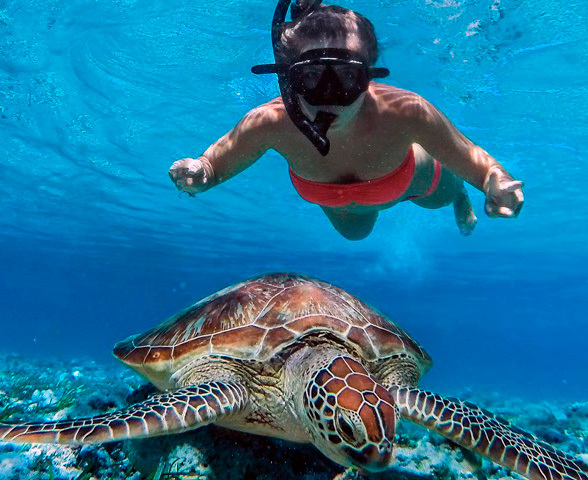 As you snorkel, you’ll meet a variety of fish and large turtles. Also, this is a place for diving and swimming with manta rays, or “sea devils”, which is a totally safe thing to do. To the North of the island you’ll find not just white sand, but also a wide reef, which at low tide forms shallow and warm pools with crystal-clear water – these are great swimming spots for both adults and children. There are all kinds of hammocks, as well as land and water swings, which are perfect for both chilling out and Instagram posting. On a hot sunny day, coniferous trees along the coastline create cosy shadows and exude a pleasant scent. In the western part of the island you can enjoy a stunning sunset among all sorts of scenery and take lots of beautiful photos. This is the smallest and quietest island among the three. People come here to enjoy solitude, meditation, beautiful snorkeling and diving. Here the morning is the most bustling time, as that's when the boats from the other islands arrive, but in late afternoon it gets more peaceful and the island becomes almost deserted. On the island you'll only find a few bungalow hotels and a few cafes. Gili Meno's population is only 500 people. The western part of the island has a small lake that produces salt in the dry season. There is also a small but lovely bird sanctuary. The beaches on Gili Meno are no less colorful than on other Gili islands. Coral reefs here is home for lots of bright fish and sea turtles – don't miss a chance to snorkel or dive to see them all. 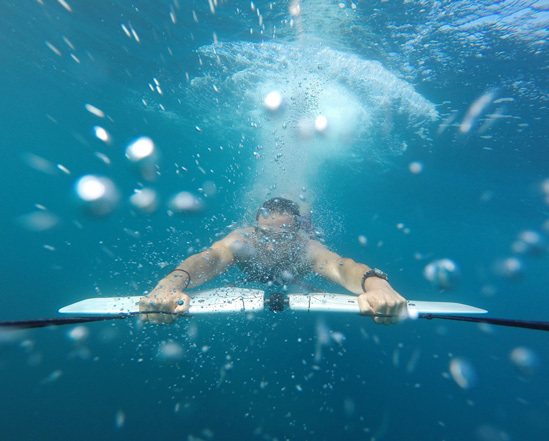 At 12-metre ocean depth there is also a small sunken ship called Bounty, which you can explore by renting diving equipment or freediving, if you have the skill! 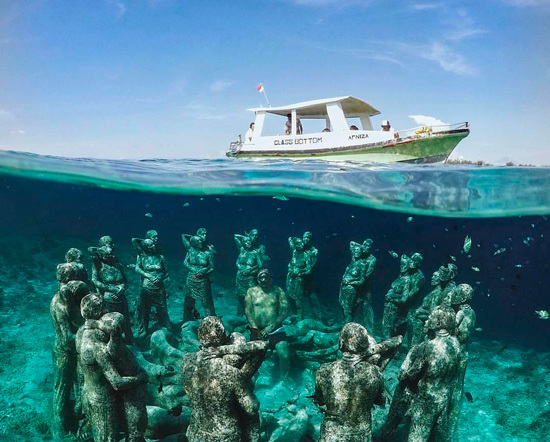 The island of Gili Meno is ideal for snorkeling and diving, as here you'll see the most beautiful underwater scenery with various statues, bikes and other decorations. The island has several small and cosy cafes, where guests and local residents get together in the evening to have a good time in a relaxed atmosphere. So which island to choose? ✔ A small, picturesque Gili Air is great for those who seek solitude and tranquility, but don't mind spending the evening in a cosy beach bar. To fully enjoy your holiday, you can get to the island yourself by booking tickets online, or you can go on a tour where everything is already included: transfer, hotel, meals and snorkeling.